The tower crane that will help to construct the new Fred & Pamela Buffett Cancer Center facility is 300 feet tall. You may have noticed a new addition to the Fred & Pamela Buffett Cancer Center project site. It can be seen over the rooftops of the campus's tallest buildings and spotted all the way from West Omaha. It is a tower crane that will help to construct the new Fred & Pamela Buffett Cancer Center facility. At 300 feet tall, bright yellow, with a wing span of 255 feet, it's hard to miss. Cranes are required for most major construction projects and used to move building materials such as steel, concrete, piping and tools. This crane can support up to 50,000 pounds. A great deal of logistics goes into the installation of this equipment. Foundation and engineering work required four weeks of preparation, while tower construction lasted only three days. Located 80 feet below ground, the concrete foundation and large anchor bolts support the base of the crane for stability. Stack towers were then vertically mounted to form the crane. The tower crane will remain in operation for the next two years of construction and throughout that time, daily and monthly inspections will be conducted to ensure safety. A crane is a very large and dangerous piece of equipment so it is essential a well trained professional sit at the helm and watch for potential hazards. The operator is the brain of the crane responsible for controlling all movement. Every morning the crane operator will make his daily 240-foot trek up the ladder to the office or in this case, cab. The operator works from inside the cab for the entire shift moving materials and communicating with crews below. 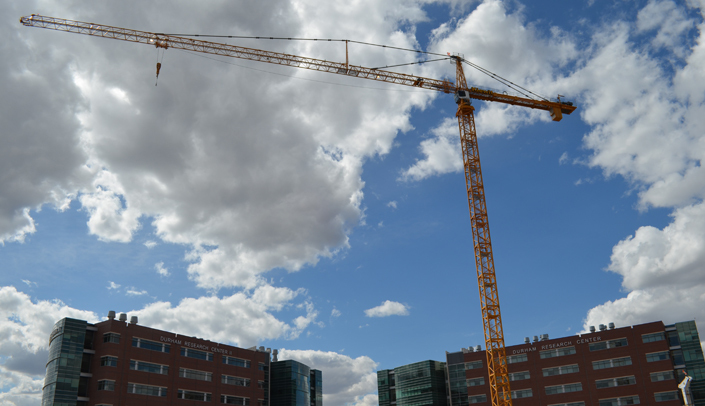 In May, another tower crane will erect in the northeast quadrant of the project site to share the workload in areas that cannot be reached by the first crane. The tower crane traveled to the Fred & Pamela Buffett Cancer Center project site from a previous project in Newfoundland. When medical helicopters approach campus the crane boom moves away from the helipad and waits to resume work until the helicopter passes and an all clear signal is received. The tower crane is 100 feet taller than DRC and DRC II buildings. For up-to-date information on the Fred & Pamela Buffett Cancer Center, like our Facebook page.